The first thing that pops into our heads when we think of gophers is piles of dirt on our lawns ruining our beautiful landscape we put so much time and effort into, rather than gophers seeking shelter inside. Well what if I told you that they can also find their way into our house. That’s right it is possible. One of our long time customers called us to ask if we could send one of our technicians out to take a look at a strange hole she found in her granddaughters bedroom. Before dispatching anyone out I wanted to get more information. I asked if she could describe what the hole looked like and if there was anything else she could tell me about it. For example, if they hear noises coming from the hole, do they hear scratching noises at night, see any dropping, etc. The only thing she could tell me is that it was about 3 inches wide, about a foot off the floor and that there is a big pile of dirt in front of the hole. I went over a few animals that I know push out dirt for example, gophers and ground squirrels. I haven’t heard of any of those found in a home but definitely could be possible. As I was listening I went through her past services and noticed that we serviced her property for gophers in the past. I asked if she saw any mounds on her lawn and she said not that she can see. 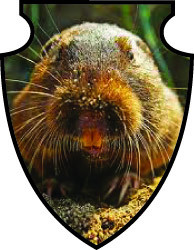 Gopher fact, one gopher can create 1-3 mounds per day. That would be a nuisance to a homeowner if not taken care of right away. Good thing she called AmeriGuard. With that said I knew I had to send our pest control supervisor Nic out there to see what was causing this problem. 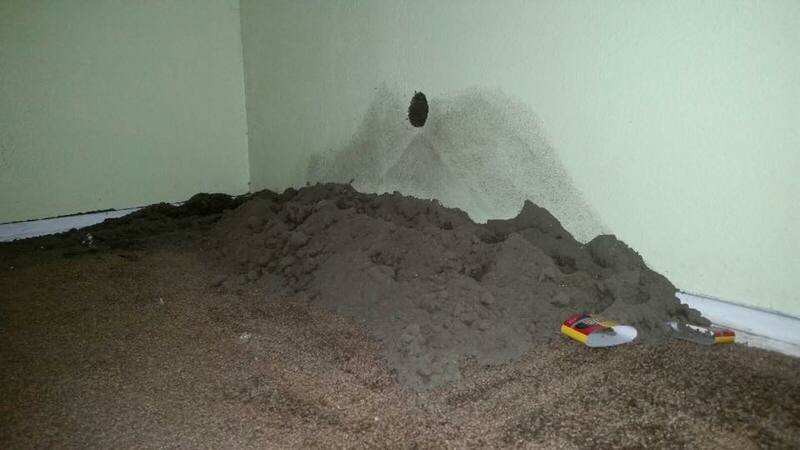 When he arrived he looked at the hole in the room and definitely saw piles of dirt as you can see by the pictures. Their house is on a concrete slab so we could not look under the home. After doing a thorough inspection of exterior of the property he noticed some gopher mounds about 10-12feet from the home. He placed grain bait in the underground runway system after using our probe to locate the gophers passage way. We also offer chemical free treatments as well. Please call our office for more information. Needless to say the gopher was taken care of, the hole in the granddaughters room was patched up and AmeriGuard has another happy customer. So if you are looking for professional Gopher Control Service in Hemet, San Jacinto, Menifee, Murrieta, Temecula, Winchester, French Valley, Beaumont, and surrounding areas, call 951-652-0505 today.